Educated Cheese: Top 10 Sox Moments of 2009: Number 5 - Papi Hits a Dinger! 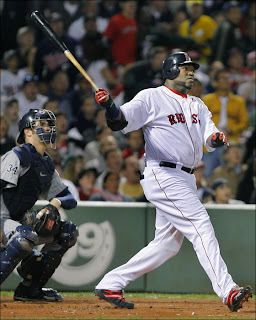 Top 10 Sox Moments of 2009: Number 5 - Papi Hits a Dinger! Everyone went ape-sh*t when Ortiz finally hit his first home run of the year on May 20th, nearly 40 games in the regular season. This was going to turn it around. This was going to put all the "just tell them Big Papi stinks" self loathing crap to shame because the Big Guy was back and it was time to start swatting dingers like it was 2005 again. Yup, that would have been sweet if it went down like that. Somehow Ortiz saw his numbers drop even more after that HR and then the whole steroid thing happened which left us all in kind of state of bullsh*t haze. Baseball people will tell you he finished with respectable numbers but there were no heroics, no putting the team on his back and flying into October, no more Comcast commercials with his special salsa dip. Shame.